The Northern Coast's civilizations left us astonishing evidence of their achievements. Tucume, the “Valley of 26 Pyramids”, was a thriving city of temples and squares built by the Lambayeque in the 11th Century and conquered by the Chimu in the 14th. The exquisitely decorated Moche Temples of the Sun and the Moon stand a few miles from the Pacific Ocean, near the 500-acre complex of Chan Chan, capital of the Chimu Empire and one of the largest and most developed cities in the ancient Americas. 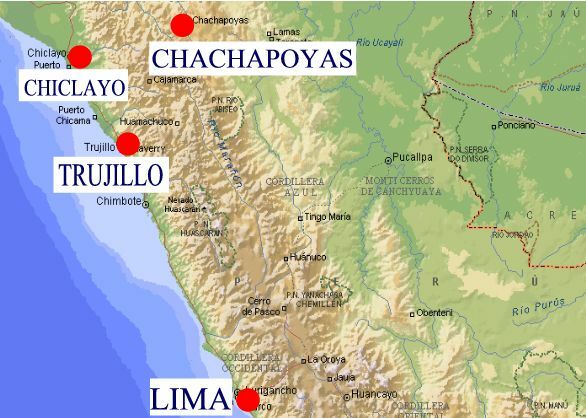 In Chiclayo you will visit the tomb of the Lord of Sipan (the richest tomb discovered in the Americas), the Valley of the 26 pyramids of Tucume and Bruning Museum where there is an interesting collection of gold artifacts and ceramics. The Moche tomb of Sipan -the richest burial site discovered in the Western Hemisphere (October 1988 - National Geographic) is a few miles east of the modern city of Chiclayo. Finely crafted gold artifacts and ceramics recovered from these complexes are on display at the Museum of the Royal Tombs - one of the finest in South America as well as at the Museum of Sican. Just south of Trujillo: The pyramids of the Sun and Moon are the largest structures ever put up in South America, and are second in the Western Hemisphere only to the Pyramid of Cholula, Mexico, in size. They formed the spiritual center of the Moche Empire, a highly sophisticated yet mysterious culture that pre-dated the Incas by nearly 1000 years. It is quite certain that the Moche Indians had contact with other civilizations in the ancient Americas, and there is good reason to believe they may have been influenced by Asian ocean- going voyagers as well. The Pyramid of the Moon contains a central, vaulted chamber, and the mountain directly behind, Cerro Blanco, appears to have been shaped by humans into a pyramid form as well. Despite their achievements in architecture, metal-working, and ceramics (one can still find countless pottery shards in the sands surrounding the site), the Moche were very militaristic, and scenes from their pottery depict ritual bloodletting and torture. They may have evolved a system of “black” magic that aided them in their conquests of neighboring peoples, or they may have taken spiritual teachings from Asia and twisted their meanings into bizarre new practices over the centuries. Huanchaco is a fishing town where “caballitos de totora” are still used by the local inhabitants, who venture into the cold currents of the Pacific in these precarious-looking reed boats. This massive adobe city, really a series of royal compounds built by the Chimu, was a major source of gold for both the Incas, and later, for the Spanish. Though well-looted over the centuries, gold artifacts still occasionally appear in the drifting sands. Contacts between Chan Chan and the Asian continent have never been proven, but there are tantalizing hints. Pottery figures depict Asiatic men with beards and turbans; even the name “Chan Chan” seems to be Chinese in origin. Don’t miss the famous “honeycombs,” where strange acoustic effects allow visitors to whisper to each other over long distances inside the adobe structures. Contact us for more info 6 days and 5 nights Lima, Caral, Chavin de Huantar, Huaraz, Trujillo, Chiclayo, Tucume, Moche.